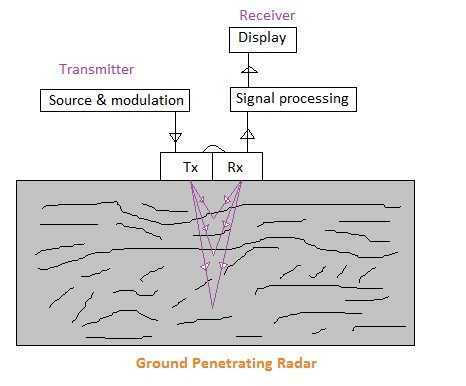 As the name indicates ground penetrating radar referred as GPR is a type of radar developed to analyze the internals of the ground. It employs radio waves in the frequency range from 1 to about 1000MHz. It helps to map ground structures and ground features. Figure depicts typical components used in the ground penetrating radar system. Similar to other wireless system this radar will be composed of transmitter and receiver part. The transmitter part consists of source signal generation, modulation and RF upconversion before feeding the signal to the antenna for transmission into the solid ground. This is opposite to wireless systems where in signals are transmitted into the air. The receiver part consists of signal sampling, signal digitization, data storage, signal processing to display and radar scope for displaying relevant information as needed. • Detects and records the different time instance of the echoes and utilizes these information to construct the image. • Provide this image information on the scope in terms of signal time delay and signal strength for the user. Following table provides ground penetrating radar depth. This data is specific to the site. It may vary depending upon many factors. One can refer this for basic comparison between different materials as well as to have rough estimate of the values.